June is an ideal time to visit Ramsey if you’re interested in birds – and even if you’re not – it’s hard to resist their charm as they float past or soar overhead. Everyone loves puffins (except Tim – he’s not too keen!) 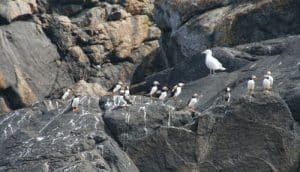 but their cousins the razorbills, chilling on rocks in the sunshine and guillemots diving gracefully (and flying a bit less gracefully on a windy day) have brought smiles to our passengers’ faces too. The fulmars seem to be doing well this year, sadly the kittiwakes haven’t done well for some years. We still get to see these delicate little gulls but in nothing like the numbers we saw 20 or 30 years ago. It’s thought that since they duck dive rather than being able to dive deep like the guillemots and razorbills that they may have difficulty finding enough food these days.